New Energy Star Attic Awareness Campaign! 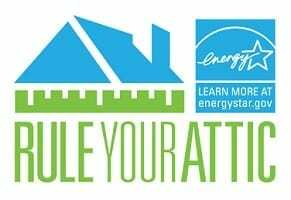 Energy Star is starting a “Rule Your Attic” campaign to help homeowners become more proactive about energy savings. So, do you know how much insulation is in your attic? Most of the homes in America are under insulated, therefore many homeowners are wasting money each month on energy bills. Having a properly insulated attic could make all the difference in the comfort of your home as well. One big misconception is that insulation is only important in the winter months, but it is actually important all year round. Insulation acts as a barrier between your homes living space and the outside air. Therefore if your home is not properly insulated you are allowing outside air to penetrate the home. The video below is courtesy of the “Rule Your Attic” campaign with Energy Star. This video shows homeowners how to properly measure the attic insulation in their home. Energy Star recommends for attics in this area of the country to be insulted to an R-49 which is about 19 inches. Meaning, anything less than 19 iches is allowing outside air to be sucked back into your home when the HVAC is running. Energy Star’s mission is get homeowners more involved with lowering their energy bills each month and making less of a mark on the earth’s environment. If you find that you have less than suggested amount of insulation in your attic, be sure to contact an insulation expert for more advice on the proper steps to making your home more energy efficient. Doing your part to make your home as energy efficient as possible, is helping create a smaller mark on the environment. Every small step helps! Over the next few weeks, take time to evaluate your home’s energy efficiency. Another good way to know exactly how efficient your home is running, would be to have an Energy Audit preformed.